By Daniel Horowitz—A sold out field of 144 duffers took to Devil’s Pulpit Golf Course in Caledon, Ontario on September 17th for a great day of golf under perfect conditions, and regardless of who had the lowest score, the real winners were Toronto’s Jewish children with learning disabilities. 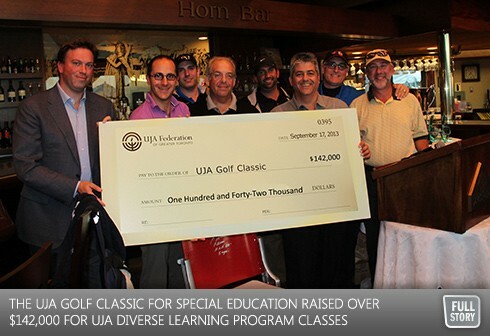 The UJA Golf Classic for Special Education raised over $142,000 for UJA Diverse Learning Program classes at Associated Hebrew Schools, which is serving former She’arim students with learning disabilities. This specialized educational program is funded by UJA Federation of Greater Toronto. Proceeds from the tourney will ensure the continuation of high quality, customized education for children who have specialized learning needs. Golfers taking part in the tournament competed for the Max & Sheila Guttmann z”l Memorial Trophy. Following the tournament, Elliotte Friedman of CBC’s Hockey Night in Canada volunteered his considerable talents as the Master of Ceremonies at a special dinner as well as a live auction that raised funds as well.